Interviewed by Rod from LittleLives in August 2015. 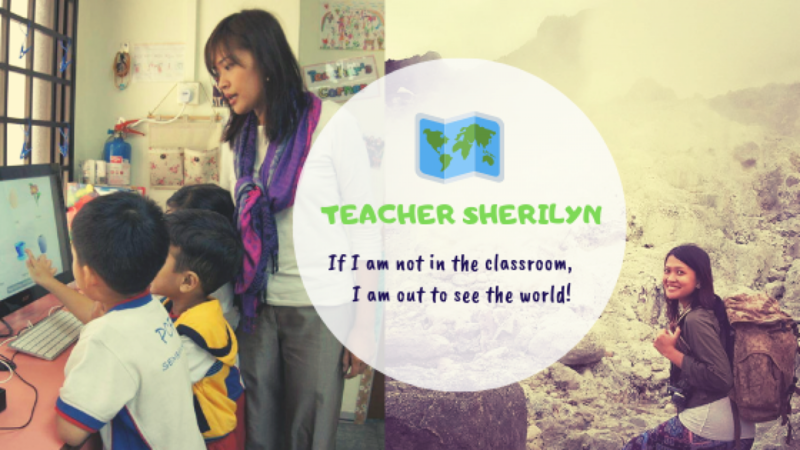 Q: I guess we would all like to know a little bit about Teacher Sherilyn, how about a short introduction or perhaps a short bio. Like how and when did it all start for you? And what attracted you to teaching in the first place? I am a Kindergarten 2 Teacher at Learning Vision @ NCS (Singapore). I finished BS Family Life and Child Development at the University of the Philippines Diliman and completed my diploma in Early Childhood Care and Education at the Bentley Institute here in Singapore. Currently, I am taking up MA Distance Education online at the University of the Philippines Open University. Ever since I was at a young age, I dreamed of becoming a teacher because of my mother. She is a secondary school teacher. I was once her “assistant teacher” checking test papers of her students and recording their grades on her class record. What I like about teaching is it helps me to make a difference in the life of young children. I always emphasize to the children under my care that they go to school not only to learn how to count, read, and write; they are in school also to learn good values and proper behaviour. I am sure they do not understand now what it means, but years from now, I know they will look back and will say, “Oh, this was what my teacher was trying to teach me”. Aside from knowledge and skills, I want to impart values and good character to the children because it is those values and good disposition that will aid them to become successful in life. On a lighter note, I like being a preschool teacher because I can do my solo concert in front of them. I can sing till I lose my voice even though I croak like a frog and I can dance till my body aches even though I have two left feet. They don’t mind! 🙂 For me, teaching in preschool is working and having fun at the same time. Q: You were chosen to be a part of LittleLives connected preschools project in 2013. Can you tell us more about your experience? Yes, I was part of LittleLives’ early attempts to connect preschools. I spent 8 days in Cambodia experiencing how their preschool works. I was attached to Springfield International School. I immersed myself interacting with the teachers, parents, and children and looking at their daily activities. There was also a day when I conducted a workshop to all the preschool teachers in Cambodia sharing some teaching strategies. It was a wonderful experience because I met a lot of teachers. They were fun and lively. We learned from each other. I was able to impart the little knowledge I knew about preschool education, and they, in turn, showed me that preschool teachers in Cambodia were open to learning new teaching strategies. It was fulfilling for me to share what I knew! We are here in this world not only for our own self but for others, too. Q: As an experienced teacher what do you think are the benefits of having a connected preschool. Especially with countries of a totally different culture… from the (administration, teacher, students) point of view in your opinion? Being able to connect a preschool to another school in a country is beneficial for the administration, teachers, and students. By connecting to a preschool in another country, the administration and teachers will encounter activities, projects or strategies unique to that preschool which can be applied in their own preschool. The Connected Preschool Project of LittleLives is supported by the theory called Communities of Practice wherein groups of people with the same passion or concern interact regularly to learn how they can do better in their field. Through the Connected Preschool Project, we are able to create a community where we can share information and learn from each other. This will improve the quality of preschool education. I remember a quotation when I was in secondary school. It says, “Even if you are on the right track, you’ll get run over if you just sit there”. This tells us that we should be constantly changing, evolving and upgrading. We need to know the latest trend in preschool education, and by being connected to a preschool in another country we will be able to exchange each other’s best practices and adopt them to deliver the best possible education to the children under our care. Q: You have read about our latest project 100 Cities. Which happens to be LittleLives latest social project to support connected preschools around the world. Do you agree that preschools should embrace this opportunity? And why? Yes, I agree that preschools should embrace the opportunity to connect to a preschool from another country because this will help in uplifting the standard or raising the quality of our preschools. As what I have said earlier, we should always continue to change, evolve and upgrade. This can be done if we know the latest events happening around us. We should not only be confined inside the four walls of our centre, but we should step out and see what is happening outside. That is what a connected preschool can do, to connect a preschool to another preschool to share and learn and make each other better. Q: What would you tell anyone thinking of starting a career in preschool education? To those who are starting a career in preschool education, accept that the beginning is always the hardest part. You will encounter a problem with the parents, with the children and even with some of your colleagues. This is normal. Be sure that you know what you are doing and stand firm on it, but also know when to compromise. I suggest that you find a mentor, a person who can guide you and from whom you can learn a lot to polish you and make you a better teacher you want to be. Be open to learning. Do not be stagnant. Serve the children. Q: If we have a time machine and you can go back in time before you started in the preschool industry, what advice or inspirational talk would you tell yourself? Find out what you really want within your heart, and you’ll never go wrong. Pursue your passion. Do not be afraid to be different. When you trudge the path different from the rest, people might express their apprehension about it. You have your own intellect. Look again within your heart what you really want and pursue it. Do not let anyone or anything discourage you from doing what you want. Take the road only a few brave souls dare to travel and leave a trail. If I have a chance to visit a school counterpart from a different country, I would choose those schools from the developing countries in Southeast Asia such as Cambodia, Laos, Myanmar, Thailand, Vietnam, and Indonesia because I want to share my knowledge and skills with them in assessing the current situation in their preschool education system and offer solutions to achieve quality education. As an advocate of free and open source software, I believe that these countries will benefit a lot from this. As we gear towards the 21st century, the power of information and communication technology will have a great impact on the lives of the children. Those children in less-advantaged countries can enjoy the wonders of ICT at no cost through the use of open source software. This will level the educational gap. From this experience, I want to acquire more knowledge and skills that will make me a better learning facilitator. I hope that I would be able to share and implement whatever I have learned from those countries to be a better early childhood educator in Singapore. See the original post from LittleLives.